He went from this to teeth in less than 2 hours! 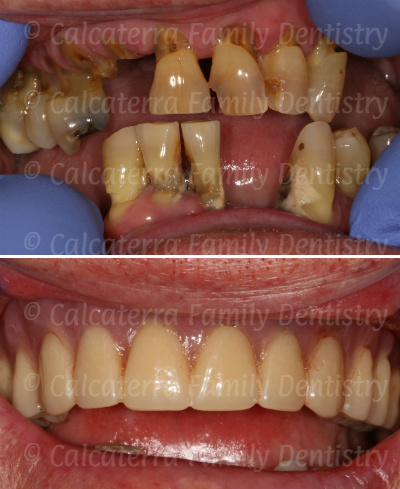 In some people, severe dental decay and/or gum disease can make it so that saving the remaining teeth is impossible. In many of these cases for many patients, full mouth extractions with the insertion of an immediate denture are recommended. Dr. Nick Calcaterra is an expert in this procedure and completes cases like these on a routine basis. You do not have to be referred to an oral surgeon. He does it with IV sedation or sometimes with just local anesthesia (a.k.a. “novocaine). 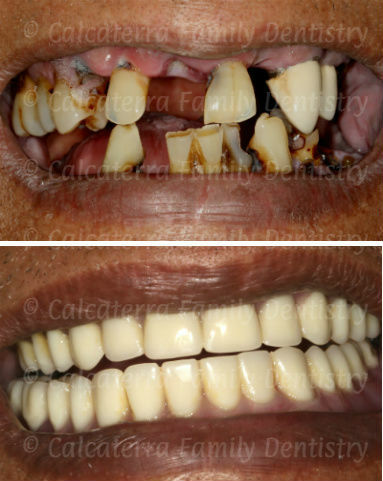 Whether it is the removal of just a couple of remaining teeth or surgery to extract twenty or more teeth, he is able to free you of pain and deliver a denture immediately that you can smile with! Want IV sedation for your full mouth extraction? Check! With IV sedation, Dr. Nick puts you in to the twilight so you don’t feel a thing. One Office, One Dentist. Most dentists do not do tooth extractions so you have to go to an oral surgeon for the extractions and then a general dentist for the denture. This means you get two separate bills, have to do twice as much paperwork, and have to coordinate multiple appointments. And then on the day of the surgery, you’ll have to drive toothless, numb, and bloody from the surgeon to your general dentist! In our office, we do it all, from the extractions, sedation (if desired), and denture. You’ll never be without teeth. IV Sedation. Let’s face it – getting twenty or more teeth surgically removed from your mouth in one visit is not something anyone looks forward to. That’s why we offer IV sedation in our office. Dr. Nick Calcaterra is one of only an elite few general dentists in all of Connecticut certified to do IV sedation – so you enter the twilight for your full mouth extractions. One Fee. Because we can complete the entire process in our office, we can offer it with a single fee. This means you can know exactly what your financial obligations are directly in the consult with Dr. Calcaterra. And for our patients who don’t have insurance, we can give you an all inclusive fee, which is typically far less than what you would see if you went to two separate offices. Expertise. Dr Nick Calcaterra does these cases all the time so he is well equipped to handle the surgery and all the aspects of fabricating and delivering the denture in one day. 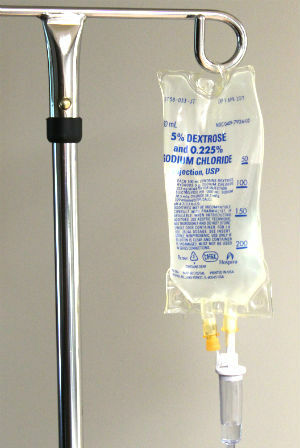 This patient from Ansonia chose IV sedation. When he woke up, he had new teeth! Consultation. You come to our office for an exam. Dr. Nick reviews your medical history and then examines your entire mouth. Next, he listens. He listens to what YOU want to achieve. Based on this, he will frequently develop a couple of different options, which may involve the recommendation of full mouth extraction and immediate denture(s). Treatment Plan. Next, we reach an agreement on what the treatment is going to be. Because you are doing treatment in only one office, we don’t have to wait to hear back from an oral surgeon. We give you one fee. Impressions and Sedation Workup. You come in for us to do impressions (frequently called molds) in order for us to make your dentures. And for those patients desiring sedation, we review the sedation protocol and get you ready for the big day. Extractions and New Teeth. On the big day, you only go to one office: ours! Regardless of whether you are being sedated, we remove all the remaining teeth without you feeling any pain. We then place the denture. Follow-Up. Dr. Nick or one of his assistants personally calls you that night to review everything. From there, there are usually a couple of post-operative visits done to adjust the denture and monitor the healing process. Are you exploring having all your teeth removed and don’t know where to start? Were you given a quote from a Corporate Office such as Aspen Dental? We’d be happy to see you. Call us (203) 799 – 2929 or visit this page to request an appointment.